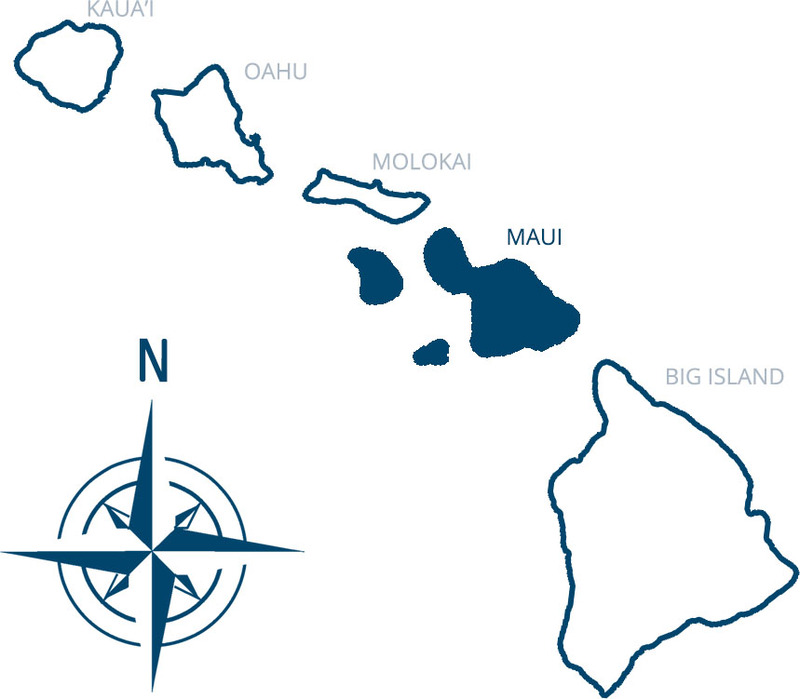 Hawaii consists of eight major islands; Hawaii, Maui, Kahoolawe, Lanai, Molokai, Oahu, Kauai, and Niihau. Only six are accessible and four are the most popular with tourists. There is no bridge that connects the islands, you must fly to each island unless there is a ferry provided (Maui to Lanai is the only ferry). The islands were formed by mountains created by the eruptions of volcanoes. When hot lava comes out of the earth from beneath the ocean floor it meets cold water and becomes solid new earth. This “hotspot” is currently located on the Big Island. When a volcano is no longer above the hotspot, the supply of magma is cut off and the volcano becomes dormant. The pacific plate has been moving in a northwest direction approximately half an inch to four inches per year taking each island away from the hotspot. The youngest island is the Big Island, the oldest are Niihau and Kauai. It is estimated that Kauai is between 3.8 and 5.6 million years old, Oahu is 2.2-3.3 million years old, Molokai is 1.3 to 1.8 million years old, Maui is less than 1 million years old and the northwest side of Big Island (furthest from the active hotspot and volcano) is 0.7 million years old and where the lava is still flowing, zero years old. Here is a brief summary of each island. 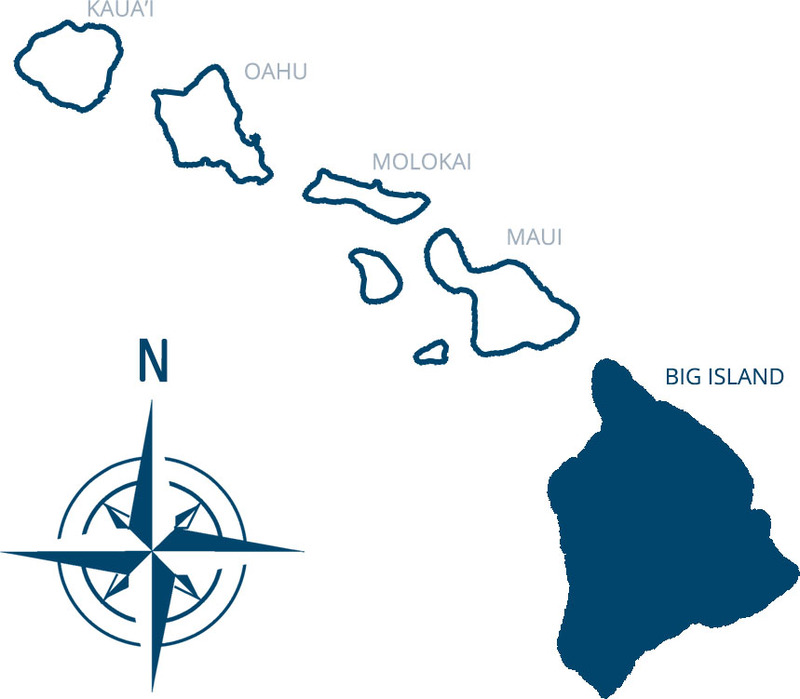 Hawaii, also known as the Big Island, is so big that every other island can fit inside of it and it’s still growing. Kilauea is the most active volcano in the world and is the only active volcano in Hawaii, it has been flowing into the ocean since 1983. The Big Island was created from five different volcanoes; Mauna Kea, Mauna Loa, Kilauea, Hialalai and Kohala. The island is home to the largest mountain, Mauna Kea, which sits 13,760 feet above sea level. If measured from the ocean floor, it is over 30,000 feet high, making it the largest mountain in the world. Big Island has green, red and black sand beaches. In the winter, snow can be visible atop Mauna Kea. 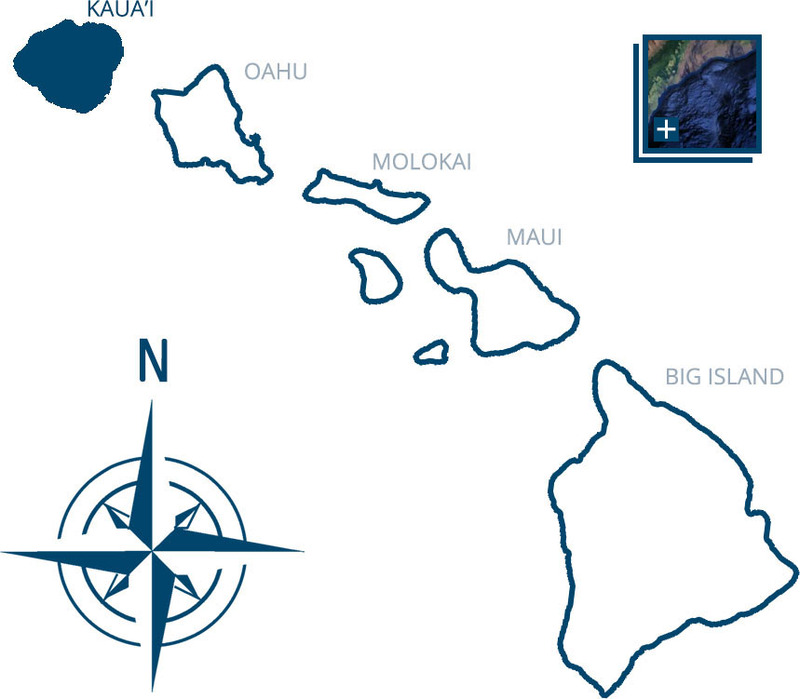 The main resort towns are in Kailua-Kona and Kohala. Big Island is home to 11 of the world’s 13 climate zones. Here you can find waterfalls, valleys, lava fields, molten lava flowing into the ocean, rainforests, giant cliffs and mountains. Only on Big Island can you ski, walk to a lava flow, swim in the ocean and hike in a rainforest in a single day. Maui is the second largest Hawaiian island. It is one of the most visited vacation destinations as it’s home to some of the world’s best beaches and waterfalls. Nicknamed “The Valley Isle,” Maui is composed of two major volcanic areas, West Maui Mountains and Haleakala. Haleakala is the largest dormant volcano in the world and is 21 miles across and 4,000 feet deep. It is a great place to watch sunrise at 10,023 feet. Maui offers something for everyone, whether you enjoy relaxing at the beach, going on hikes, shopping, adventuring or eating. Maui is home to one of the most beautiful drives in the world, The Road to Hana, 45 miles long with 54 one-lane bridges and 600 hairpin turns with endless waterfalls. Maui also has white, red, and black sand beaches. Most of the resorts are in Wailea and Kaanapali. If you’re looking for nightlife both Lahaina and Kihei provide a night of entertainment. Oahu is the third biggest island, and the most populated of the islands. 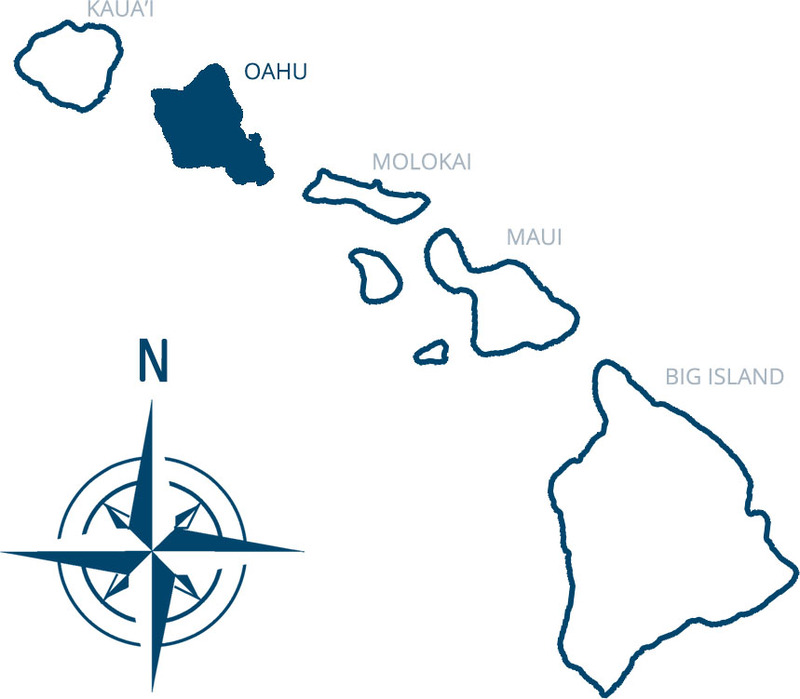 Nicknamed “The Gathering Place,” Oahu is home to Waikiki, Pearl Harbor, Honolulu and the fabled North Shore. Oahu has a lot to offer as each side is distinct in its own way. The only similarity the whole island shares is traffic. Oahu is one of the most visited tourist destinations in the world. There are plenty of options when it comes to price and where to stay on Oahu, 99% of the hotels are in Waikiki and Honolulu and it can get crowded at infamous Waikiki Beach. However, there is no shortage of nightlife, shopping, bars, or entertainment here. Oahu is home to some of Hawaii’s most breathtaking beaches from Lanikai and Kailua on the East side, to the seven-mile miracle stretch of beaches on the North Shore. In the winter, the North Shore becomes a surf mecca as the world’s best surfers flock here to surf the biggest and best waves in Hawaii. Oahu offers something for everyone, from budget friendly hotels and dining, to Hawaii’s best nightlife and shopping and some of the best hikes can be found here. Kauai is the fourth largest island and only 10% is accessible by car. One of the oldest islands in the Hawaiian island chain, “The Garden Isle,” has mountain ridges that will leave visitors in awe. Kauai has the most coastline filled with beaches, 50 miles to be exact, more than any other island and it’s usually uncrowded. The infamous Na Pali coast takes up 17 miles of the islands North side and is one of the most beautiful places on Earth. It’s recommended to book a helicopter or boat ride to see and experience this awe-inspiring place. The island’s North and South side have the most hotels, fine dining, and shopping. This island is also home to the wettest spot on Earth, “Mount Waialeale,” which has an annual rainfall of 450-470 inches. Kauai is perfect for people who love adventures as it features plenty of hikes and waterfalls. Home to Waimea Canyon, also known as “the Grand Canyon of the Pacific,” this canyon stretches 14 miles across the western end of the island. Kauai is a place of beauty and relaxation, it does not have as much nightlife as Oahu or Maui and restaurants here close early. Kahoolawe is the smallest island and is uninhabited. It’s only 12 miles long and 45 square miles in size. Known as “The Target Isle,” the US military took control of the island and used it for training purposes up until 1994, when it was returned to the Hawaiians. There is still unexploded ammunition present on the island. It is currently controlled and managed by the Kahoolawe Island Reserve Commission. The state has already begun restoring the island by removing animals and planting vegetation. You need a special permit to visit this island. Kahoolawe is a part of Maui County. Lanai is the sixth largest island and is 141 square miles with 47 miles of shoreline. It is the smallest inhabited island in Hawaii and sits eight miles off Maui’s shoreline. Known as “The Pineapple Island,” Lanai once was home to a pineapple plantation that produced 75% of the world’s pineapples. The population here is around 3,000 with the majority living in Lanai City. There are no street lights on this island. There are only two resorts here, The Four Seasons Resort Lanai and the Lodge at Koele. Lanai is a snorkeling mecca, because it’s so secluded, the water clarity and the unharmed reefs make for excellent snorkeling. Lanai is also perfect for romance if you’re seeking seclusion and quiet. Although it’s small, the island offers plenty of fun adventures but you’ll need Four-Wheel Drive to get there. Whale watching is also great here. Larry Ellison, co-founder of Oracle, bought 97% of the island in 2012 for $300 million, the other 3% is run by the state. Lanai is part of Maui County and is accessible via ferry from Lahaina. Molokai is the fifth largest island and sits eight miles off Maui’s West shore. Molokai is considered the most Hawaiian island and dubbed “The Friendly Isle.” Only on Molokai will you have the opportunity to have a whole beach to yourself, the island is home to the longest white sand beach in the state. Molokai is great for snorkeling, scuba diving, fishing, whale watching and hikes and a great place to relax. This is an island that takes you back in time, there are no shopping malls, no street lights, no traffic, and no hotel chains. Visitors to the island can stay at the island’s only hotel, Hotel Molokai or one of the five condominium projects. This island boasts rainforests and the world’s tallest sea cliffs. Molokai once had a leper colony in Kalaupapa. It is said that King Kamehameha V exiled all who contracted Hansen’s disease to this area on the island’s north shore, which can be visited via mules. The site is now a National Historic Park. Molokai is a part of Maui County. Niihau is the seventh largest island, and is kapu (forbidden). Nicknamed “The Forbidden Isle,” because non-native Hawaiians are not allowed to go here. This is the only island where the Hawaiian language is the first and main language. In 1863, King Kamehameha V put this island up for sale for $10,000, and a Kauai resident, Elizabeth Sinclair, purchased the island. Today, her descendants, the Robinson family, are the owners of this island and have committed to preserving Niihau and keep the Hawaiian heritage alive. There are approximately 250 native Hawaiians that live here. There are no stores, restaurants, cars, or paved roads here. The Hawaiians live mostly off the land. The only way to access the island is if you’re invited or the Robinsons offer guided tours and hunting safaris that run from $440 per person to $2,500. A boat tour company off Kauai offers a snorkeling trip off one of Niihau’s beaches, however, the boat is not allowed to dock onto the island. Most residents work on the Robinsons’ ranch. This island is also home to one of the rarest shells, the Niihau shell, a Niihau shell lei can be valued at thousands of dollars. Niihau is part of Kauai County. Copyright © 2019 Hawaiian-Islands.com . All Rights Reserved.